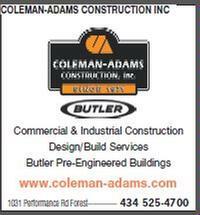 Founded in 1971, Coleman-Adams Construction, Inc. is a General Contractor specializing in Commercial and Industrial construction. We offer Design/Build services and Butler pre-engineered building systems. We have proudly served the Lynchburg community and surrounding areas for 40 years, and look forward to many more years of service to the community.